Joanne is a fully insured and PVG approved Clinical Reflexologist working in Edinburgh and the Scottish Borders offering reflexology treatments at your home for your comfort and privacy. 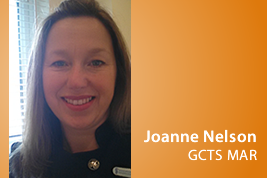 Joanne trained to a high standard at The Complementary Therapy School, a highly respected private training provider. Graduating from The Complementary Therapy School which is credit rated by Edinburgh University at SCQF Level 8, 80 credits, Joanne has been awarded the Practitioners Diploma in Clinical Reflexology. She is a Full Member (MAR) of the Association of Reflexologists (AoR) the largest membership body in the UK who ensure all its members have met the strict entry requirements to be full practising members. As part of an on-going commitment to reflexology, Joanne undertakes Continued Professional Development (CPD) training. This may include conferences, seminars, workshops and training days as necessary, this is compulsory for Full Members of AoR, providing clients with up to date training, skills and knowledge. "I'm very passionate and enthused about reflexology and enjoy seeing the positive reaction from the body, and positivity it engenders in my clients." Joanne is also qualified to support the conception and maternity journey with reflexology. Contact Joanne today for an informal chat to see how reflexology can benefit you.